Are Extreme Weather and Flooding Events Signs of Climate Change Tipping Point in Far Western Kentucky? 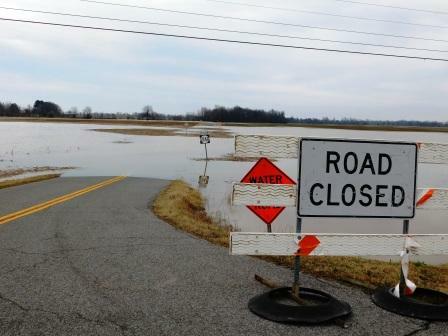 Next to and along the roaring waters of the Mississippi River that border the counties of Ballard, Carlisle, Hickman and Fulton Kentucky are new signs of extreme changes in local and regional weather. According to our Kentucky Utility heating bills for January and February was 43 degrees. This compared to 44 degrees in 2018 winter months. These temperatures were running about 12 to 15 degrees hotter than the span of winter time in 2015. The Great Ice Storm of 2009 disrupted normal life for weeks when the ice storm took down regional and local electric power grid. Thousands of people in far Western Kentucky lived in shelters or with friends and relatives due to massive power outages. Now, in 2018 and 2019, the boundary of freezing temperatures and serious ice and snow is 90 miles north of Hickman. The issue now is buckets of rain. West Kentucky still has a water problem. Now, instead of ice storms, damage to life and property is from severe flooding. High waters at Cairo Illinois have forced a bridge closing from Kentucky. High water at Paducah forced installation of massive flood gates at wall protecting downtown Paducah. This was the second of use within the last two years. A flood of this force historically only occurs every 10 to 15 years. Now it was happening on an annual basis. At the Brookport Bridge from Paducah over to Illinois, water lapped at the roadway, some 50 ft. from normal stage. Rare flooding on Murray's streets showed images of people trapped in their cars with raging flood waters up the windows. Emergency water release at Kentucky Dam with 100,000 gals per second released. 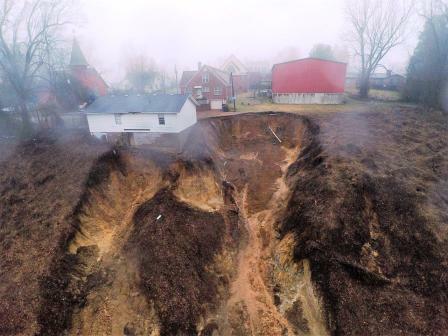 Massive landslide (100 ft. x 200 ft. crater) formed in downtown Hickman, near the county courthouse, threatening the Methodist Church, community building and parsonage. Near Nashville Tennessee, Interstate 24 East closed from the slippage as a hundred foot wall of water, mud, sand and rock flowed onto the roadway. Estimated time of recovery was put at one week, but that has proven to be too optimistic. This new intense trend of warmer and wetter extreme weather is but one emerging warming sign that what used to pas s for normal is no longer the case. New weather and climate change modeling by scientists has predicted that our area will enjoy the same warmth as found 500 miles to our south. Handling the changes in weather and water will be a challenge for leaders and residents of the Purchase.